The H2gO was designed for the enthusiast on the go. Measuring up to 17 inches deep, 13.5 inches tall and 12.75 inches wide, makes this case highly portable without sacrificing in the cooling or technology departments. The case is like all Mountain Mod cases broken into 2 separate chambers. The Top chamber houses a full ATX (or smaller mATX) motherboard and no other heated components. The 2 x 120mm intake fans blow in symmetry with the back 2 x120mm fans for full AIR chamber effect. If air just isn't enough for you then purchase a Thermochill PA 120.2 and attach it internally on the front of the unit (other manufacturer radiators can work as well by attaching one fan to chassis only and the other to radiator then chassis). If one Thermochill PA 120.2 isn't enough purchase yet another and attach it to the back of the unit, externally and route your tubes through the lasered out holes in the chassis for up to 7/8 inch OD tubing. Still if that is not enough 2 more 120mm blow holes exist on the bottom chamber and are quite capable of holding a Thermochill PA 120.1 or any other single radiator. Also on the lower level up to 3 x 5.25 devices can be mounted. There is 17 inches of clearance for the most endowed of power supplies. A single set of Mountain Mods 120mm HD racks are included for mounting up to 3 hard drives out of the box. Purchase an additional set for up to 3 more drives. These can attach to the intake or exhaust on the lower chamber. The exterior of the case is all 1.65-3.25mm thick ALU. The Motherboard tray of the H2gO is made from 1/4 inch cast acrylic and separates the two chambers. Elegant holes are laser cut into the acrylic to route cables from the lower chamber up to the motherboard. The motherboard IO ports are oriented on the side of the case like our Mountain Mods Bob Slay, to allow for easy connectivity of PCI, IO, USB, Fire Wire and other connections. The H2gO includes a set of Mountain Mods acrylic feet. These can easily be swapped out with our caster kits for rock and ROLLing action. The H2gO comes with a single high quality anti-vandal power switch. These can easily be substituted with Bulgin style switch for LED indication. Select the optional chrome handle install for single hand carrying action. 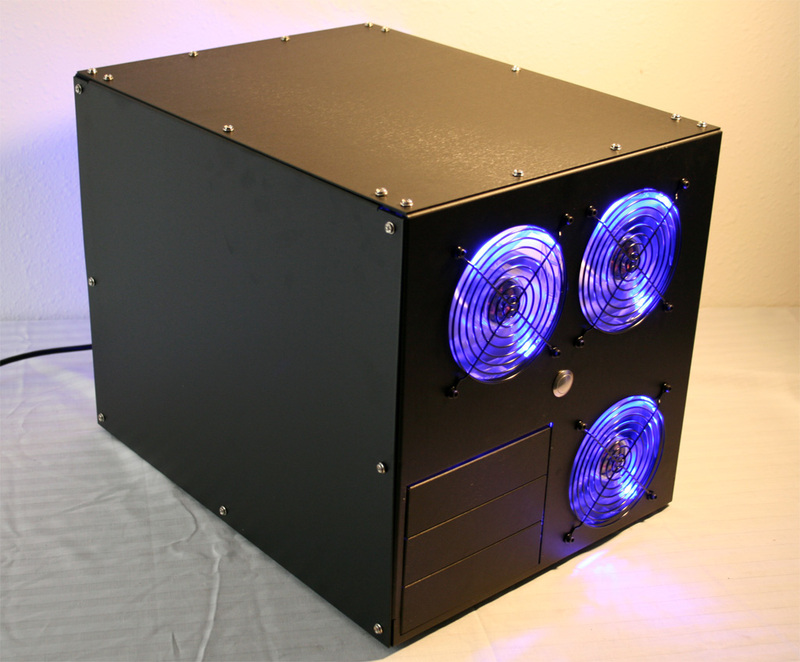 All of these features with a great sticker price make this unit a Mountain Mods must have!